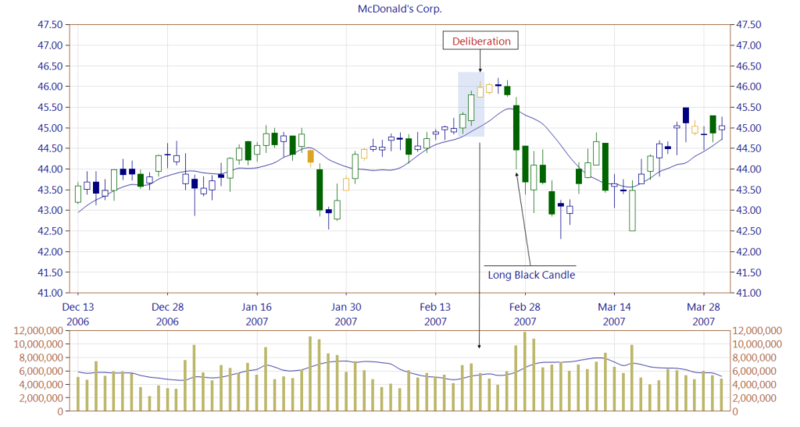 The Deliberation is a three-line bearish reversal candlestick pattern. It is formed by three white candlesticks. The first and the second line of the pattern have long bodies. The third candle has shorter body than two previous candles. Every next candle is opening above the prior opening price. The same applies for the closing prices. The third candle appears as a short line and can be one of the following: Short White Candle or White Spinning Top. The opening price of the last candle is slightly lower or higher than the previous closing price. Shimizu provides somewhat different characteristic of the Deliberation pattern. The first candle is short, the second one is long, indicating a significant upward move (a price gap is visible in the diagram of his book). The third candle is short what indicates that the bulls are exhausted of attempting to push price higher. Because all pattern's candles have white bodies, the pattern acts as a support zone. The pattern is confirmed if the bears manage to move price down below the first candle opening price. Figure 2. It rarely happens that a price drop immediately follows a Deliberation pattern. The market usually "deliberates" during 2-4 candles following a pattern, about into which direction to go. Such behavior may be explained by the pattern's construction, presented on the chart. The bulls are pushing price up on two first white candles. On the third candle, they form a short white candle, however, indicating that the bears counterattack. Two first pattern's lines create a support area. On the chart, two first candles are formed at a high trading volume, which makes the support zone stronger. The third candle is classified as a Short White Candle, formed at a lower trading volume than two previous candles. The short body indicates indecision (deliberation) over direction, which lasts 3 days. The market "deliberation" is located within the area drawn by the last pattern's line. On the fourth day the market opens lower than the third pattern's candle closing price. A Long Black Candle appears at a very high trading volume and the bears are in full control. 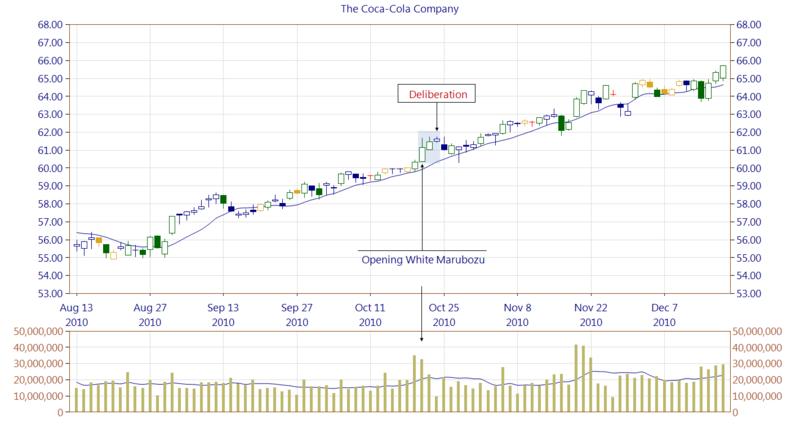 The Deliberation pattern is widely discussed, and quite often is wrongly interpreted because some traders expect it to work immediately after its appearance. The pattern's name, deliberation, explains well the market situation. Figure 3. While discussing the Japanese candlestick patterns, we always are emphasizing the importance of assessing the market context in which a particular pattern occurred. A common beginner's mistake is to use also data following a pattern, which normally is impossible, as we cannot know the future when a pattern appears. On the chart, we see a Deliberation pattern preceded by an uptrend lasting from the beginning of August 2010. Within that time, the market moved up by 10%. The second line of the pattern shows weakness because a trading volume decreases. The third line is formed at even lower trading volume, much smaller than an average. The pattern is followed by a black candle opening lower than the previous candle. The market tries to move down skipping "deliberation" phase, which is unusual for that pattern. However, there is a problem: low trading volume. Indeed, the Deliberation pattern caused price pause for several days before the climb resumes. 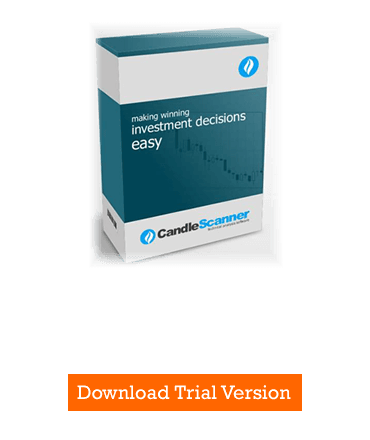 Below you can find some Deliberation pattern statistics calculated by CandleScanner software. To see more detailed statistics, for other markets and periodicity try our CandleScanner software.